Sunday Night Baseball needs to be rebooted. I gave ESPN’s new Sunday Night Baseball crew a chance last season. 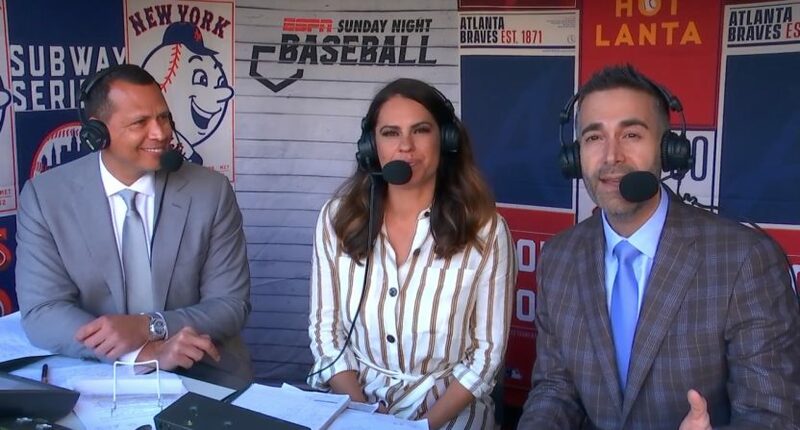 The trio of Matt Vasgersian, Jessica Mendoza, and Alex Rodriguez got off to a shaky start, and never really gelled together, even during their one playoff game. Our readers voted the crew as the worst that called an MLB Postseason game last year, even behind John “Captain Miserable” Smoltz and Joe Buck, long a favorite target of our readership (even though that hatred seems misplaced at this point). I’ve watched a couple Sunday Night Baseball broadcasts this season, mainly because ESPN has remembered the Braves exist following their 2018 division title. And after watching those two broadcasts, including last night’s Mets-Braves game from Atlanta, I’ve come to the conclusion that this booth just is not working and that ESPN needs to move on from it as soon as they can. The main problem with the booth is the chemistry, or more specifically the lack of chemistry, between Vasgersian, Mendoza, and Rodriguez. The three just don’t work well together. Vasgersian is quite poor at setting up both Mendoza and Rodriguez, and also isn’t a good traffic cop in the booth (which is so important in a three-person crew). There are often moments of awkward silence in the booth (a near impossibility with three people), and also moments where the play-by-play announcer and one of the analysts start talking over one another. When watching a Sunday night game, I don’t get the feeling that these three broadcasters are watching the game together, but that they’re all watching separately and want to get their own thoughts in. Instead of being a “team,” the Sunday Night crew comes across like three individuals. Chemistry isn’t the only issue with the booth. Vasgersian talks a whole lot, but often expands upon his own takes and opinions at the expense of the game happening on the field, which is maddening for a viewer. Mendoza’s analysis is fine, but does not come very often, and it seems like there are minutes at a time during the broadcast where she’s silent. As for Rodriguez, he’s much better suited to a studio role, where he has shined for Fox in the Postseason (partly because he has a great host in Kevin Burkhardt to help reel him in). His analysis, like Mendoza’s, is fine, but it seems like he runs out of material early in the game, and relies on first-person stories when he doesn’t have anything else to contribute. When paired with others, all of these broadcasters could be just fine. Together, it’s a very tough listen. The production of Sunday Night Baseball is also odd. Early during this Sunday’s game, the network would cut to highlights from other games…but for just one game at a time, typically showing one or two plays, and making those cuts in between at bats. It’s disjointed, chaotic, irrelevant, and somewhat insulting to the live game and those watching it. Why would I want to hear some brief analysis about what just happened when I could watch an hours-old clip from a different game? It’s almost as if ESPN is trying to satisfy the desires of those who loved the nightly Baseball Tonight show with live cut-ins, only these cut-ins aren’t live and thus, irrelevant. There was also some sort of issue with the on-field mics on Sunday, resulting in every bit of contact at the plate sounding like the ball was going 450 feet. Also, the mics picked up plenty of audible f-bombs, and bizarre grunting on the mound from Mets reliever Jeurys Familia. Better sound quality is great, but not to the point where it’s distracting fans from the game and causing more talk about the noises than the game itself. I was somewhat optimistic about Sunday Night Baseball this year. After all, Rodriguez was a novice in the booth last year and Vasgersian was working with two new partners. But three Sundays into this season, it’s evident that there hasn’t been enough (or any) improvement. At the end of 2017, following the departure of long-term play by play announcer Dan Shulman and analyst Aaron Boone, I sketched out a few possibilities for Sunday Night Baseball. I somehow failed to account for a fifth option – ESPN keeping Mendoza in the booth and adding a play by play announcer and analyst that hadn’t worked together before. That option has been rough from day one, and if ESPN had just promoted/hired an existing pairing and/or slotted Mendoza in with an existing pairing, the broadcast would have been a lot smoother and well-liked. Instead, they hired the big name in Rodriguez and the experienced announcer in Vasgersian, and much like the Monday Night Football crew in 2018 (which included the big name in Jason Witten and the experienced announcer in Joe Tessitore), it’s gone quite poorly and shows minimal signs of improving. Then again, Sunday Night Baseball has typically been tweaked just about every year over the last decade. In his seven years as play by play broadcaster following Jon Miller, Shulman worked with seven different analysts (including Terry Francona and Bobby Valentine for a season each). Miller and Joe Morgan weren’t immune from tweaks during their final two years calling ESPN’s premier baseball broadcast, either – they were joined by Steve Phillips in 2009 and Orel Hershiser in 2010. After a little over a year together, it’s increasingly clear that the Vasgersian/Mendoza/Rodriguez trio is not going to be a long-term answer for ESPN, and that the network will need to make changes – unless buries its head in the sand and insists everything is fine, of course.